Shortly after moving to Montreal in late ’97 I joined the crew at CinéGroupe on Heavy Metal: F.A.K.K.2 – the sequel to a film that i had really enjoyed as a kid. It was exciting to be on board at first, and I worked on the film for about four months as a senior designer doing locations and props mainly. I worked under Director George Unger. He seemed cool, but the production was disorganized, mismanaged and literally generally under equipped. The first day on the job I discovered they had no desk ready for me, paper or pencils. So, I was sent home for a few days. When I returned the next week they had managed to scrounge together some equipment for me to use. Paper and pencils were still in short supply for some time though, so it was a good thing we had lots of erasers. No really, that’s not a joke. But we made the best of it. Also for a floor with three productions on it, we had just one photocopier. That was fun. The film did get done. But for my full time on the crew, there were a lot of production management problems. For me in the end the line producer quit, and then the director quit on the same day over the mounting disorder. 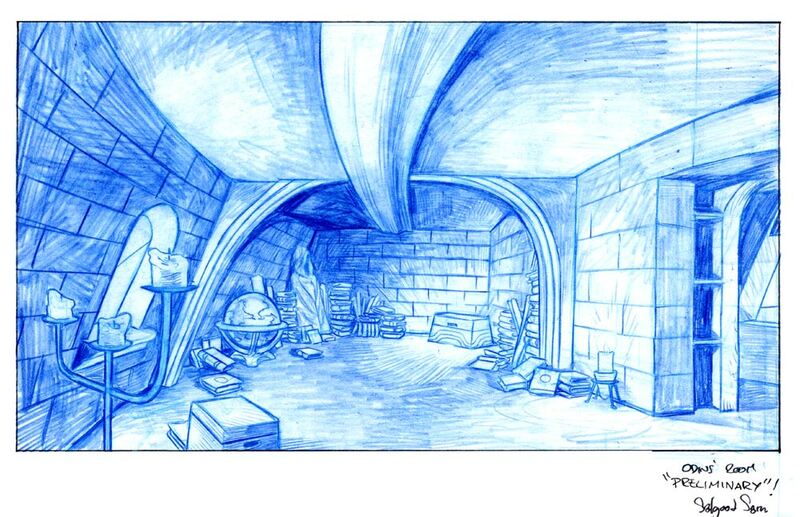 I left shortly after, I was never credited on the film for my work, but they ended up using my designs for the pit nearly for verbatim, some of the shots look a lot like different angles I drew on it. A simplified variant used on screen, of the fighting pit I designed for the film. Most the rest I did I think ended up scraped when the new director took over. Here’s some of the highlights of the work I did on the job that I saved. Just a fraction of it really, but they were my favourite bits. Despite the awful train wreck of a film that was made, and the comically badly managed production I witnessed, I’m pretty proud of this stuff, and would love the chance to do something like it again on a decent production. Early on we were all asked to take a stab at designing the main character too, who was based on Julie Strain. They didn’t use it but this set starts off with my take on her too. Fun. Course, not nearly enough skin compared to what they went with, but oh well.